Formulated with hydrating Hyaluronic Acid which attracts and retains moisture to help diminish the appearance of fine lines and support elasticity for smoother, plump looking skin. 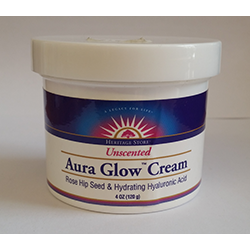 Edgar Cayce recommended the Aura Glow™ formula of olive, peanut, lanolin and vitamin E oils as “food for the skin” to enhance superficial circulation and healthy, moisturized skin tone. With petal softness and natural antioxidants, Rose and Rosehip seed oils gently nourish a younger looking complexion. Whipped to a feather-light texture these intensive moisturizers are ideal for beautiful skin. Ingredients: Purified Water, Arachis Hyprogaea (RBD Peanut) Oil, Cetearyl Glucoside (and) Cetearyl Alcohol, Olea Europaea (Olive) Fruit Oil, Lanolin, Phenoxyethanol and Ethylhexylglycerin, Xanthan Gum, Rosa mosqueta (Rose Hip) Seed Oil, Sodium Hyaluronate (Hyaluronic Acid), Citrus grandis (Grapefruit) Extract (and) Glycerin, Rosa damascena (Rose) Flower Oil, and Vitamin E (Tocopherol). Directions: Gently apply to your face and décoleté as often as desired, day or night.